There are a lot of raglan patterns out there from various companies. Finding one that sets itself apart can be hard to find. 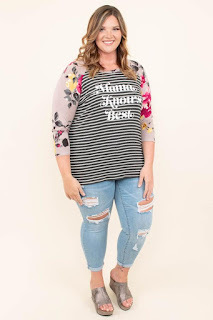 The new Amelia from Annelaine Patterns does just that. 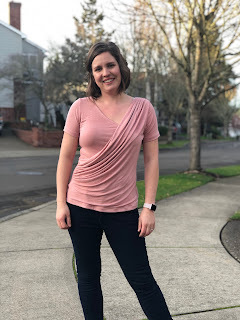 It's a raglan but with a slight dolman to the sleeve. It also has two different size cold shoulder options plus a straight or curved hi-low hem. I chose for this test to make the regular shoulder with curved hem. I struggle with getting raglan tops to fit properly because of my wider shoulders and borderline need for an FBA. How this pattern is drafted, there's enough ease at the bust to avoid an FBA which for me, saves time. Amelia was an extremely quick sew, with the most time taking on hemming. The length on the back is perfect for wearing with leggings and fully covering your booty. For my look, I was inspired by this raglan from chicsoul.com. I follow several clothing boutiques online to find inspiration and this one jumped out at me. 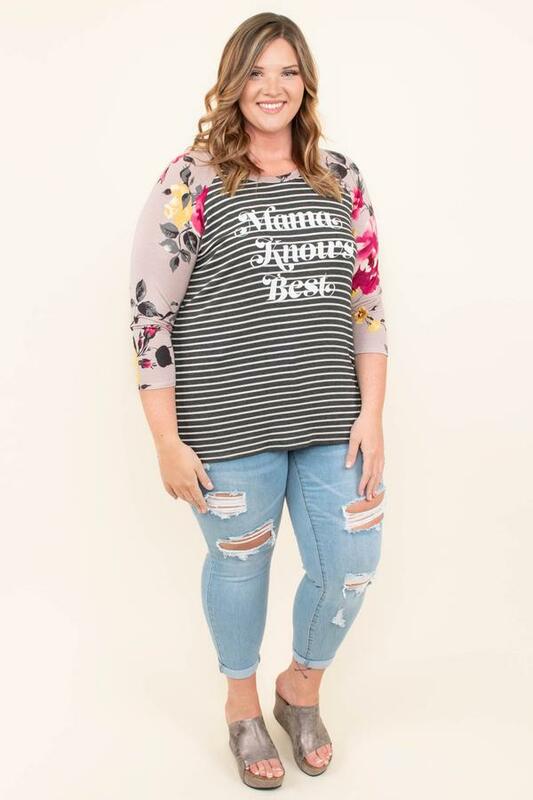 I plan to add vinyl to the shirt but am still trying to decide if I want it to say "Mama knows best" like this one or go with something else. I really liked the large print floral sleeves paired with the charcoal stripes. For fabrics, the bodice is a charcoal and ivory striped rayon spandex. The weight on this fabric is really nice paired with DBP sleeves. I don't find it has any sheerness but drapes really well. The large print floral has a light blush background and is currently on sale for $3.99 a yard, as part of the spring clearance from Mily Mae Fabrics. Both the girls and women's Amelia patterns are 50% off for 24 hours only! This makes them $5 and $6 respectively. Then they are on sale for 40% off through 3/31/2019. Moral of the sale, buy them today!